To start, I'm aware that "Ribelle me fantastic" is not a sentence that makes sense, but if you visit Ribelle, you will understand. 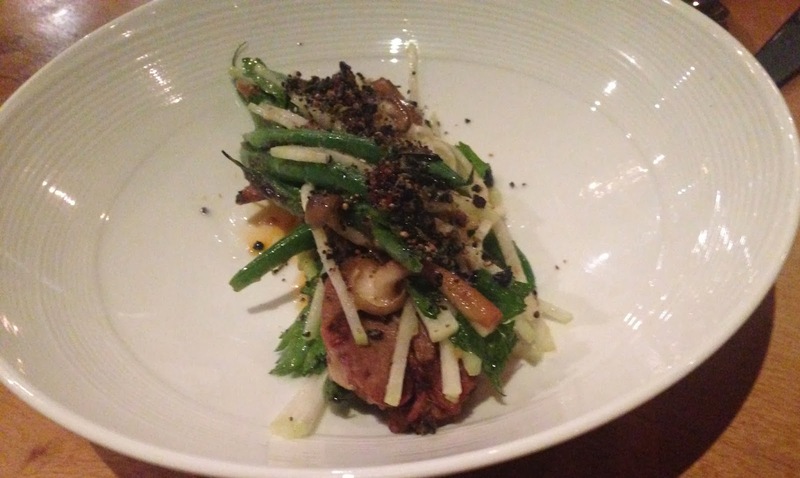 Much like Tim Maslow's other restaurant, Strip T's this restaurant is a gem to behold. The quaint, modern, bright Ribelle is in Washington Square featuring small plates with big flavor and fresh ingredients. As soon as you walk in you notice the large communal table made of beautiful wood. The bar is also wood and fully stashed. The kitchen is open promoting a feeling of modern and airy. The light fixtures look like large sequins and geometric shapes. One of the highlights of the trip was the pre-meal. I stood at the communal high top table by the kitchen sipping on a beat, citrus and gin cocktail after speaking with the chef. This cocktail was of the best I'd ever had and I was surprised. 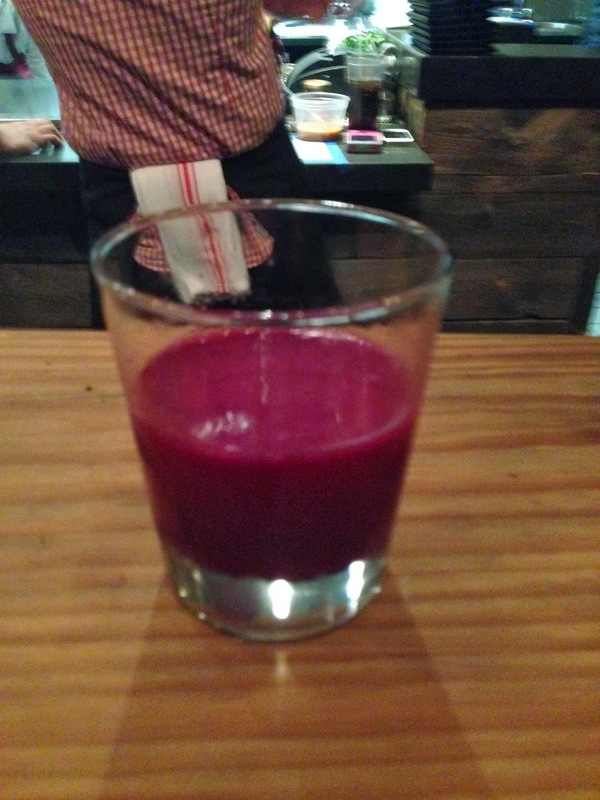 The beets were refreshing combined with the gin and lime and tasted like fall. It was such a great cocktail that four out of the five people eating and drinking in our group ordered it. We sat down at the communal table at the end. I was expecting to feel cramped but it felt like we were having our own party not a part of our neighbors' dining experience. There were five of us in the party and we were there as a part of a monthly dining group. We all partook in their $30 price fixed menu because it was before 6:30pm. I wouldn't be surprised if they do away with this. The restaurant is so hot right now, they don't really need to do anything from a price standpoint to draw a crowd. The price fixed menu was full of great options, probably 3/4 of the regular menu. I was so excited about the bolognese and the mushroom lasagne that I ordered two pasta dishes. 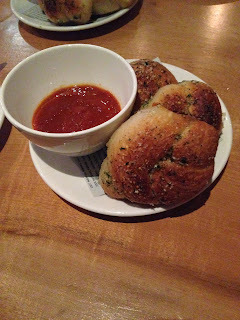 When I was last at Ribelle, I ordered duckfat garlic knots. Wow, they were fantastic, so I ordered them again. Needless to say, my meal was very carb full and I probably could have ordered one less small plate, but it was just so much fun. My dining buddies ordered squid, kale and pasta with squash. The best part of the large dining group was getting to experience lots of dishes. When deciding what to order, I decided against to kholrabi because it had veal tongue in it. The manager was so sweet and sent over this dish so that we could try it. The veggie portion, a mixture of kholrabi, beans and spices was awesome. I even liked the flavor of the veal tongue, however the consistency was pretty fatty and rubbery. If I were to order it again, I'd ask for just the veggies. For those who haven't tried it, kholrabi is a bulb that can be shredded, it's in the broccoli and cauliflower family. The duckfat garlic knots came out first. They were moist with oil, salt, herbs and garlic. They came with a zesty tomato sauce that paired nicely with the rich rolls. I could have made a dinner of just these rolls and sauce, they were that good and that filling. 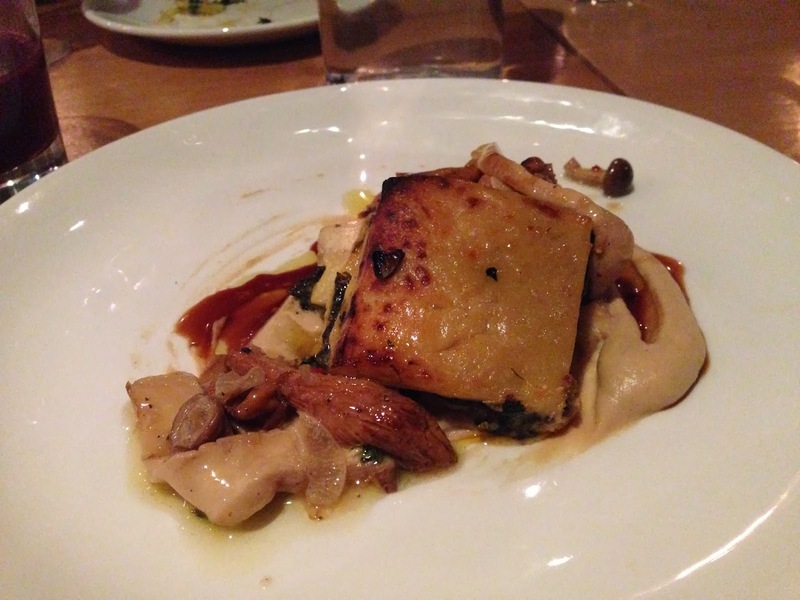 The mushroom lasagne had meaty mushrooms with homemade vinegared ricotta cheese. The pasta tasted homemade and perfect. 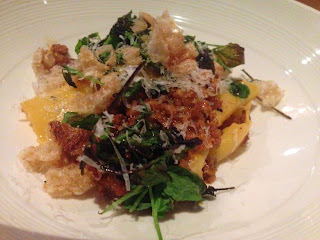 The pappardelle bolognese was rich with different kinds of meat. The tomato was not overpowering, it was all about the meat. It was topped with fried pork skins and fried baby greens. When I had the pork skin on its own the flavor and consistency was not great, but the combination of this in the dish was outstanding and added a little crunch to an already flavorful dish. Another highlight was the truffled toast one of my dining partners ordered. Remember the eggs in a frame that your mom made you when you were sick? Maybe that was just my mom. 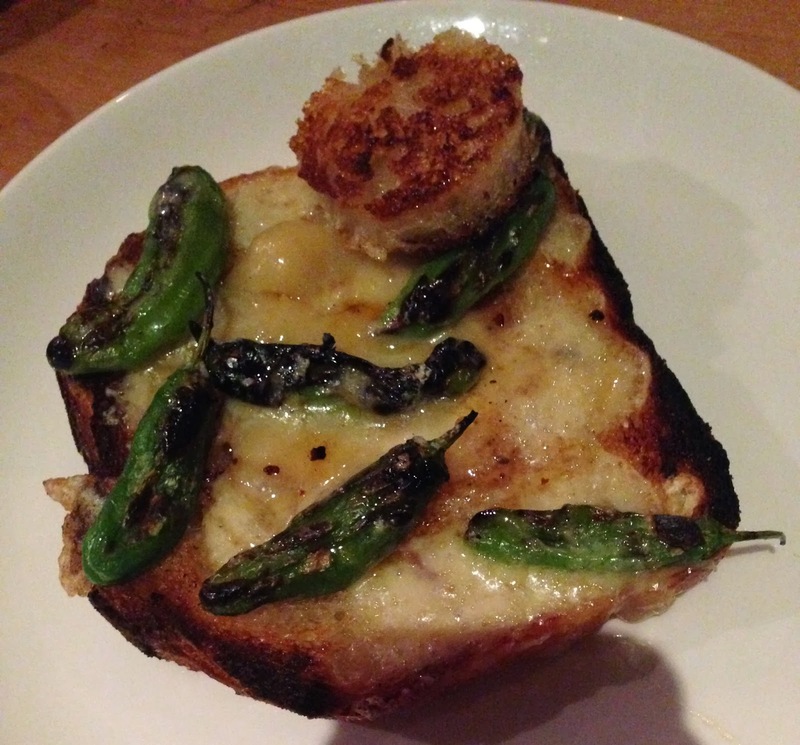 This was one piece of thick toast covered in truffle oil, cheese, egg and little peppers. The dish was comfort on a plate. Overall, Ribelle is worth the hype and I recommend that you go and try it. The beet cocktail was outstanding. I can't wait to go back and try some new dishes. While the pastas are fantastic, I recommend mixing them in with more veggie dishes or protein than what I did. Maybe that way there will be room for dessert. Looking forward to going back and trying the ever changing menu.